In many countries around the world it is easier and cheaper to get a can of coke than it is to get a glass of clean water. That fact was the inspiration for a new art installation from Dutch artist Helmut Smits in which he transforms soda back into the water it came from. His piece, The Real Thing is both a work of artistic expression and creative engineering. 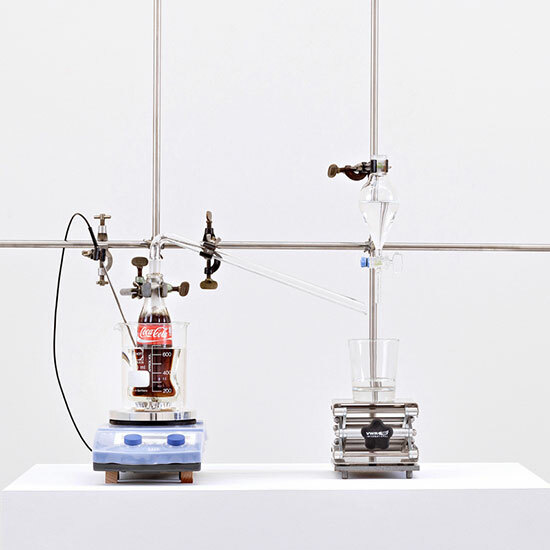 Along with the help of the Synthetic Organic Chemistry Group from the University of Amsterdam, Smits built a contraption that filters Coke into drinking water. The process is similar to distillation. Coke is boiled, generating water vapor. The vapor is then condensed and funneled into a glass. Smits adds some minerals like calcium and potassium to ensure that the water is safe to drink and the whole process is complete. It is not the first time someone has claimed to turn soda into water, but drinkers described the earlier attempt as tasting like sugar water so it was probably a less thorough. When asked why he wanted to take on the task, the artist told Dezeen, “I try to look at the world as a child or an alien…when I looked at Coca-Cola I saw dirty brown water so it was logical to filter it back to clean drinking water.” Just don’t expect him to use it to try to solve any worldwide water shortage problems. “I just want people to laugh and think about the sh•t they’re drinking.” Mission accomplished.